BQEF grew from two distinct roots. One is the long missionary work of Northwest and Central (Indiana) Yearly Meetings, through which evangelical Quakerism grew in Bolivia, starting in 1920, to approximately 30,000 Bolivian Friends today. The other is the Quaker Study Tour series, beginning in 1995 with British Friends led by Pam and Ken Barratt, through which numerous Quakers from the UK and US became acquainted with Bolivia and Friends there. BQEF sprouted from these roots in 2001. 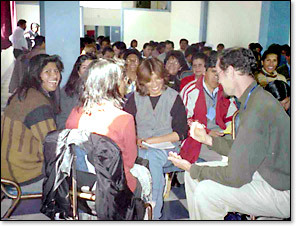 Dona Manoukian (Langley Hill Meeting) and Newton Garver (Buffalo Meeting) arranged for two young Bolivian teachers, Cecilia Paco and Loida Cutipa, to visit the US for seven weeks in June and July of 2001. They spoke to ten different Friends gatherings in the eastern states (interest groups at FCE, FGC, PYM and BYM, as well as informal groups at two Quaker retirement communities, two monthly meetings, and gatherings at AFSC and USFW) about Quaker schools in Bolivia. Cecilia and Loida were well received by Friends here, few of whom have had a chance to meet with Bolivian Quakers. 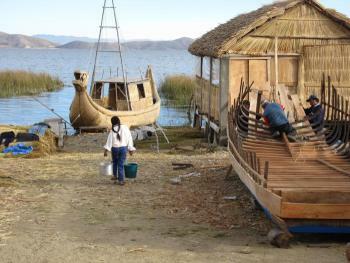 The Bolivian teachers took a rich experience back with them. It is instructive that they both enrolled again in English courses at home. Dona and Newton returned to Bolivia with the Quaker Study Tour in October-November 2001. They had discussions with Bernabé Yujra (now BQE-Bo Coordinator in La Paz) and others about education. Newton stayed on an extra week to visit schools and meet with Quaker educators. The plan's original focus was on scholarships for post-secondary education of Bolivian Friends, an urgent need because of the large number of qualified but impoverished young Friends in Bolivia. At the end of 2001 and beginning of 2002, discussions were held with key people in established Quaker organizations (QBL, FAHE, FWCC, FCE, FUM, and Pendle Hill). It was determined both that these other organizations welcomed the initiative, and that none could adopt BQEF within its fold. A particularly valuable gathering of experienced Friends in Philadelphia in January 2002 impressed on Newton that BQEF had little chance of success unless it had staff and a five- or ten-year perspective. A five-year plan was prepared, and a budget for 2003, including staff, was approved in July 2002. Bernabé Yujra coordinated the work of BQEF in Bolivia informally in 2002. In 2003, he worked half-time for BQEF while retaining his job as a teacher. Since January 2004 Bernabé has been working full-time for BQEF. He now has a 3/4 time assistant, Juan, who helps with organizing workshops and keeping records. Former intern Alicia Lucasi also works part-time in the office, prmarily with scholarship students, volunteers and the Student Residence program. Bernabé brings to his work 20 years of experience as a teacher, several terms on the Executive Committee of INELA, six years working with Quaker Bolivia Link, and the respect of Friends in Santidad, Amigos Central, and INELA Yearly Meetings. Three students from Guilford College traveled to Bolivia in May-July of 2003. They assisted with English classes in the Quaker schools and taught evening classes for adults. It was a great success and was followed that fall by Haverford graduate (and later BQEF board member) Sarah Kaufman volunteering in Bolivia for four months. Thus a fifth dimension has been added: volunteer service opportunities. In July 2002 and October 2003, Newton Garver met with educators from Santidad and INELA, all of whom are enthusiastic about BQEF and are working together on this project. One vision is that Friends could create model schools in Bolivia, as Friends have done elsewhere. The Spirit blows as warmly through this movement in Bolivia as in the US. In August of 2004, BQEF contracted for a half-time Coordinator in the US, and later that year we launched our first website. Scholarships for higher education (in Bolivia) are the first priority. We began with 15 scholarships in 2003 and have grown to 45 for 2017. Young Friends in Bolivia are enormously grateful. We established computer and language labs in three Quaker schools, funded additional hours of instruction, initiated both AVP and Quaker Education workshops (in Spanish), enriched language programs through volunteers, and founded an internado in Sorata. This is a preliminary verson of this lesson for First Day Schools. If you make use of this, please send us feedback so that we may continue to improve it.